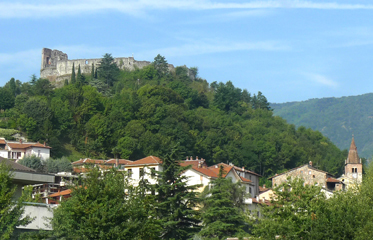 Avigliana is a little hill top city approximately 30km from Torino, in Piemonte. 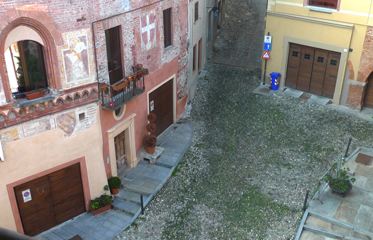 12 000 inhabitants are hidden in this historic town almost completely preserved. We were lucky to find accommodation in one of the oldest buildings in the city, wonderfully restored by the owners. [AirBnB - Dimora storica in Avigliana]. 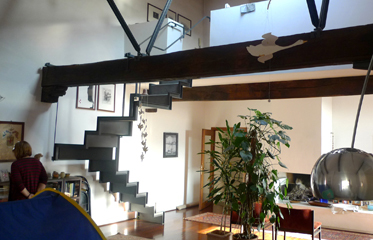 Architect and professor at the Torino school of restoration, used available space in very contemporary way and they are still not disturbing authenticity of the building [photo bellow right]. They let us make few photos around the house overlooking this little square and with fantastic views of the whole area. Square itself is also quite unusual located in a very steep hill it accommodates few obviously once very rich houses, mostly from XIV century. All of them are restored with more or less skills, but all of them are used today. Some historic photos we found are showing various stages they went true. Today all of the houses are residential but in the past some of them were making this space much more social. It was very pleasant to observe how locals are communicating between themselves, accommodating each others needs, for example for access to the houses, usage of the public space, eliminating car parking, etc. Just up the hill is another square in Avigliana even more exciting and enjoyable.